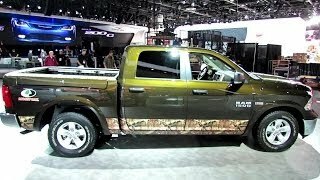 The Ram Mossy Oak Edition has returned for the model year 2014 and will be displayed at the 2014 North American International Auto Show next week. The Mossy Oak Edition was introduced in 2011 and is designed for enthusiasts who are passionate about the great outdoors. 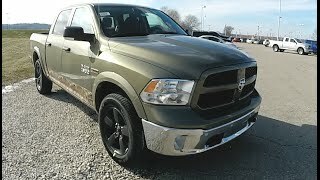 The Ram Mossy Oak Edition is available exclusively as a Ram 1500 4x4 Crew Cab model, and is based on the popular Ram Outdoorsman. It can be had with a choice of three exterior paints: Black, Black Gold Pearl and Prairie Pearl. 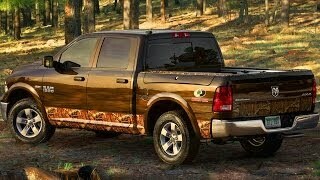 All cars will feature a mossy oak camouflage on the lower edges of the body and in the cargo bed's upper edge. RamBox Cargo Management System will be available for the first time. 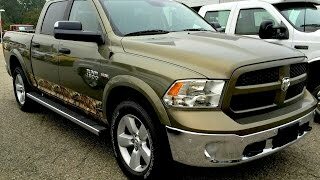 The center column of the Ram’s instrument panel is finished in Mossy Oak Break-Up Infinity, as are the door panel inserts. 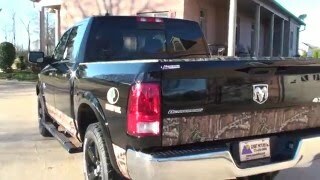 It has embroidered headrests with the Mossy Oak logo. Customers can opt for Espresso Tuscany-colored Katzkin Leather seats with Mossy Oak seatback embroidery. The model is scheduled to arrive in dealerships early this year at a starting price of $39,985, plus $1,195 destination charge.